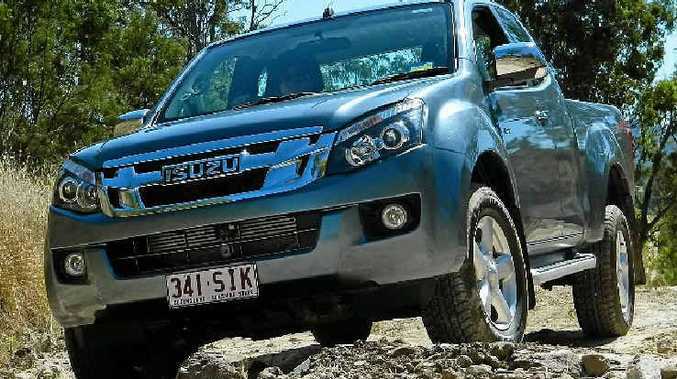 BRUTE UTE: The D-MAX can handle hard terrain. WHEN Big Rigs was given the opportunity to test drive the new Isuzu D-MAX 4x4 LS-U Space Cab by Brisbane Isuzu we just couldn't pass up the offer. Now we don't want to get too technical but there are a number of attractive key features to the new D-MAX which has seen its launch into the market gain a lot of attention. The D-MAX comes in variety of ute models in 4x2 including single cab and a high rise version as well as the crew cab ute 4x4. And it is big on safety, with six airbags, electronic stability control and traction control available on the entire range, not just the fancy ones. It also boasts great fuel efficiency, as we were putting it through its paces we averaged 8L/100km off road and 7.8 L/100km on the highway, which was impressive considering the next part of its appeal, its performance. The 3.0-litre turbo diesel has some nice get up and go when you put your foot down, but that is little wonder when the same engine that is sitting in the D-MAX happens to be nearly identical to Isuzu's NLR 275 Light Truck which boasts an 8-ton GCM (gross combination mass). Both on and off-road out near Toowoomba in Queensland the D-MAX handled all situations we threw at it. Having some nice ground clearance, 235mm to be exact, meant even some of the more challenging terrains the D-MAX was put through it handled without any problem. For those who may have experienced a D-MAX in the past you will be happy to know that the interior has had a major facelift, including more room inside the cab. With the firewall moved forward, and reconfiguration of the pillars there is more room in both the front and the rear. The seats are quite comfortable which makes it a pleasure to drive both on and off road. The outside also looks great and it's really setting itself apart from the bygone days when they were related to Holden. Overall if you're looking for a new ute that is economical, has some great safety features, comfortable to drive and can battle off -road as well as all the others in its class then don't overlook the D-MAX. Copyfit using verticle space needs to be on when using factbox. This is found in the paragraph pallette.